Representatives from Partnership for the Delaware Estuary, PennEnvironment, National Audubon, and Tookany/Tacony-Frankford Watershed Partnership met with Congressman Boyle during Hill Day. On March 12, 2019, 39 individuals from 25 Coalition for the Delaware River Watershed member organizations went to Washington D.C. for the Coalition’s annual Delaware River Watershed Hill Day. In total, organizations met with a total of 29 Congressional offices that represent the watershed states of New York, New Jersey, Pennsylvania, and Delaware. The Coalition thanked Members of Congress for their support of federal clean water funding and protections and advocated for 2019 policy priorities, which included the Delaware River Basin Restoration Program, the Land and Water Conservation Fund, and the Clean Water Act. Clean water advocates from all over the watershed ensured that Members of Congress know that clean water is a priority for the Delaware River, its tributaries, and the people and wildlife that call it home. Tookany/Tacony-Frankford Watershed Partnership (TTF) is one of the organizations that came to D.C. to stand in defense of clean water programs. TTF is dedicated to improving the health and vitality of the Philadelphia and Montgomery County watershed by collaborating with municipalities and leading communities in education, stewardship, restoration, and advocacy. In one of four Facebook Livestreams during Hill Day, Executive Director Julie Slavet spoke about what clean water means to her. Additionally, TTF brought two Community Trail Ambassadors and constituents, Markeeta Holmes and Naseem Baksh, to Washington D.C. for them to meet with their Members of Congress. As part of my work with TFF as a Community Trail Ambassador, I went to Delaware River Watershed Hill Day to share stories about Tacony Creek and met with Representatives Mary Gay Scanlon, Dwight Evans, Madeleine Dean, and Brendan Boyle. The Tacony may be small, but maintaining it is important to the health of the entire Delaware River Watershed, which provides clean drinking water to over 15 million people, including Philadelphia. These waterways are a site of recreation for our neighborhoods and provide habitats for our migratory bird friends. National Audubon, Pennsylvania Environmental Council, National Wildlife Federation, and Ducks Unlimited representatives at the Capitol for Hill Day. Going to D.C. to bring the challenges and successes of the Tacony to the attention of members of Congress was an amazing opportunity to contribute to efforts in preserving our waterways. It was an honor to be a part of this initiative, to learn from other environmentalists doing great work throughout our region, and to be a voice for this creek that plays an important role in my life. Moments like these are powerful reminders that we’re not alone in our work to elevate our natural treasures to the level of love and protection they deserve. Whether you call it the Tacony, the Tookany, or the Frankford – we must keep fighting for our little creek! As a Community Trails Ambassador and a concerned citizen, I felt like it was my civic duty meet with Members of Congress in Washington D.C. and remind them what we are fighting for, namely access to clean water, land and water conservation, wildlife habitat, and Delaware River Watershed investment. The exciting day began in the Longworth House Office Building cafeteria where materials were dispersed and we met other organizations that would be in meetings with us that day. While walking down the hallway to meet with Representative Dean, I was nervous because this would be the first time I’ve ever advocated for an issue with a Member of Congress. However, the meetings were much more accessible than I had anticipated: introductions, legislative “asks”, questions, and discussion went smoothly throughout the day. By the end of the day, we felt proud and satisfied for all we’d accomplished. On our way back to Union Station for our train ride home, we walked by the Capitol Building and that’s when I decided that this wouldn’t be my last trip to D.C. The day was memorable, impactful, and I learned a lot about the essential role advocates play in educating legislators. 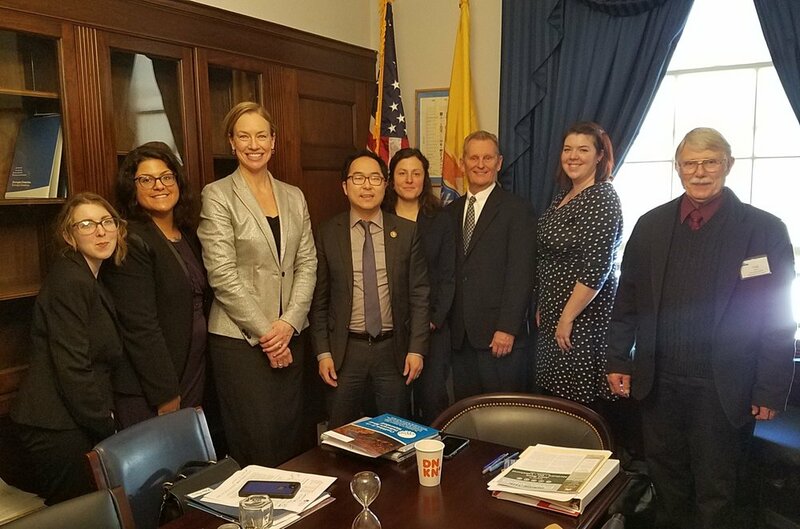 The Coalition for the Delaware River Watershed, NJ Audubon, Pinelands Preservation Alliance, NJ League of Conservation Voters, and Great Egg Harbor Watershed Association meet with Congressman Kim on March 12th.